After getting some positive feedback on My Champion, I decided to make a post-jam version. My first thought when doing the post-jam was that I shouldn’t go overboard. It’s just a jam game after all… My next thought was: Screw it, let’s just go overboard! So here are the additions to the post-jam of My Champion, and this time, I really went OVERBOARD! * Tweaks to the gameplay: I tweaked the gameplay to make it more playable. Notably, you no longer go faster when running diagonally. The hit box against the gorillas are a bit smaller. * Half-time: To respect the rules of soccer (or at least some of them), you get a half time at 45 min and get to switch sides. * Translation to French and Korean: Yep, the game is entirely localized in French and Korean. I translated every words to French, and a friend help me translate to Korea. You can change the language dynamically during the game by pressing ‘L’. This took a lot of work! * Extra options: You can mute the game. You also have the option to toggle auto-kick. I just added auto-kick to be able to play the game with one hand while holding a beer, but you do play much better by using the space bar. * Animations: I added the Kick animation for the cat. I also added the gorilla’s walk and kick animation. * Head-turning: Oliver now sometimes turns his head slightly towards the ball. It’s a bit useful when you need to find the ball offscreen. * Sound effects: You can hear the ball getting kicked! * Illustrations: The text is now paired with a nice illustration that describes the story. You can now see how I originally designed coach Tapo (he’s a rabbit!). Also the cat has a name: Oliver! * Practice mode: You can practice at controlling the ball on an empty field before the real match. * Referee: Yes! There is now an in-game referee. Though it might just look like a smaller cat, it’s actually a hamster. He doesn’t affect the gameplay, but you can push him around to calm your nerves. * Goal-keeper: I love this addition, because it’s a big reference to an anime I used to watch in France. I hope those of you who also watched it will recognize who I’m referring to. Note that in theory, this makes the game much harder, but hopefully the adjustment to gameplay compensated for that. * Multi-player coop mode: That’s right! Multiplayer! I implemented a mode that lets you play with a friend on the same screen. Ok, it’s no longer “You only get one”, but it’s ok. We’re in post-jam ;-P. The second player use the keys ASDW or QSDZ for AZERTY keyboard 😉 and SHIFT. Both players have to remain on screen, so if one player falls behind, he’ll get dragged on by the stage’s boundaries. Note that the 2 player mode is unlocked only once you win a match, so I hope you guys can actually beat the game. * Vicky: Not only you get a second player, but it’s a feline chick! Here name’s Vicky. She’s pink, she’s faster than Oliver, she can push him around, but she’s weaker at kicking the ball. * 2 additional endings: Since there’s a new coop mode, I had to add two more endings. One for team victory, and one for draw/defeat. There’s also a nice little storyline to explain the inclusion of Vicky. * Crowd: I was going to add the crowd, but to get to it you would have to go pretty far past the game’s boundaries. Meh… I think I’ll go without it. * Music for title screen: That’s actually the last thing I want to add before releasing the game on Newgrounds. I’m contacting some composer to help me come up with a nice theme song. Meanwhile, enjoy the post-jam version, and if you haven’t yet, feel free to try and rate the Jam entry. Have a happy new year! Here it is my post mortem about 0RBITALIS. For this game I got inspiration looking at other themes in the final round. It’s hard to make a game that is as vague as “You Only Get One”, but when you couple it with “Gravity” and “Chaos” it’s much clearer what you can actually do. I have always been interested in games which explore how simple rules (such as Netwon’s laws) can generate beautifully complex behaviours. Most of the “features” of the game are actually consequences of the strong time constraints Ludum Dare imposed me. For instance, mi initial idea was to have a moving camera that could zoom in and out, but I didn’t have time to code it properly. And this automatically lead to a “stay in the system” mechanic. The vector fields that you can see in the background was a debug tool I used to test and calibrate planets’ masses, but when I realised that it was fitting nicely with the style, I decided to leave it there. Since the very beginning of the voting period, 0RBITALIS got a lot of attention: so far, it’s both the most voted and commented entry in the 48 hours competition. I think part of its success is due to its aesthetic: it’s simple, yet effective. I spent lot of time polishing the game rather then designing more levels. This can really do the difference, especially when games are picked almost exclusively by how appealing their screenshots look like. 0RBITALIS has doing unexpectedly well. For this reason I am already working on a full-game version that will include both more levels and new mechanics. There will be probing missions, for instance, which require to scan a celestial body for a certain time. I am already working on landing missions as well, but I’d rather keep them mysterious for now! Since I *hate* menus, 0RBITALIS won’t have one. I am working on a different system, however, that looks like a star chart. Player will be able to select levels and to change settings just touching and connecting stars. I also collected lot of statistics about levels but… I’ll keep them for another post! If you liked the game, you’re more then welcomed to vote it or leave a comment on its LD48 entry page. If you want to follow 0RBITALIS news and further development, you can find me on Twitter as @AlanZucconi. 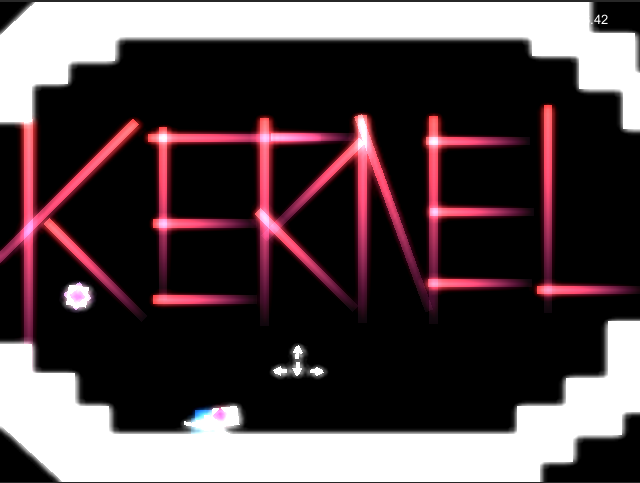 KERNEL is an action game about left-hand right-hand coordination. You can play and rate it Here. Idea Generation: “You only get one” is a rather general theme. It can fit into nearly every established genre. So, I decide not to care too much about the theme and just make a game that I want to play. I usually design games by asking “what if”s, “What will happen if you only get one player with a 2-player co-op game?” Will it be fun? I don’t know, so let’s prototype it quick and dirty, and see if its fun. Tech: I use Unity 3D 4.3 because I want to try it’s new 2d features and learn more about Unity. I found it quite neat, but it has no tile-map support, and the default sprite shader did not support lighting. 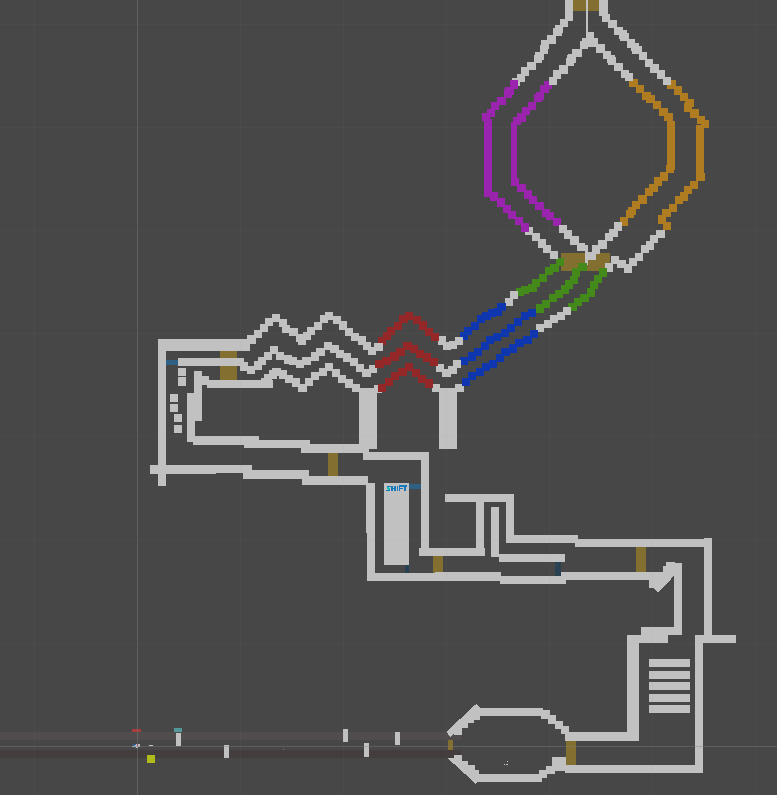 The blue thin lines are where collision detection happens. To prevent double collision at one side, I made the lines shorter. Since I have no mood for opening photoshop and draw some thing, I decide to make the level solely by primitives in Unity. 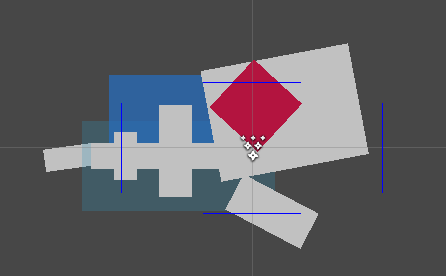 And because of the collision detection, I must only use rectangles! So, everything in this world is consist of rectangles, including characters and texts. Somewhat like a snake, isn’t it? The Gameplay: The gameplay mechanics shows some potential and IMO it’s quite fun. After the compo many new design ideas emerge in my head based on this double-control scheme. I will polish more and put them in a new version if I have time. Graphic style: The “neon-cube” style works quite well as I expected. Control: The control is a bit floaty, the friction is too low. It made this game very hard to do precise movement. Difficulty: Because of the control, easy stages became really difficult. 1.After death, the collision is not well handled because of state switching. This will make the players happens outside the wall. 2.The ending part is not complete, it will looping levels. 3.Visuals are not polished enough. Learning a Engine during compo session: Frankly speaking I did not use Unity very frequently and I think I still not familiar with it enough. Next time I must ensure that I know all the basics of Unity before participating in a game jam! 1) Keep it simple, no gravity, no physics. 2) Think of new patterns, learn more about engine. 2) Test content pipeline for full-HD graphics. And i broke the first rule almost immediately after i started working. At first i wasn’t quite sure if one limb mechanics is going to work, so i spent about 2 hours experimenting with physics model configuration, character mass and different approaches to moving the limb until i hit the fun combination. After that i started adding variants to basic grabbing and moving mechanics. But it didn’t get into the Jam-build, as i didn’t have enough time to make bullets and shooting mechanics. Controls in the game are hard to master, so i had to slowly introduce player to the motion and physics. First few level were going to be just “acrobatic”, and i only managed to make 3 levels. I used the free Unity with the new Box2D physics, and my library of Unity classes with all kind of maths, utilities, and base objects (that’s why i’m doing jam, i can’t work without an extensive library of functions, mad props to everybody who can use bare minimum and do all the math from scratch in 2 days). 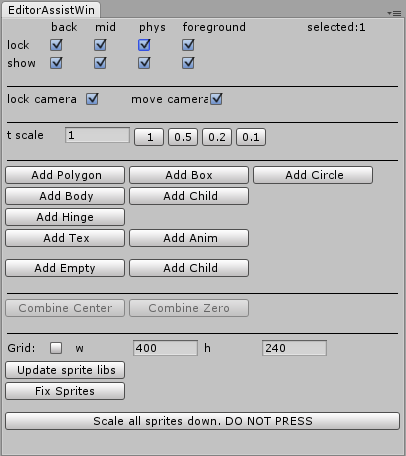 I know, unity now has default 2d-transform, but this one works in 3d as well as in 2d, allows to transform all meshes and physics objects (not just 2d sprites in 2d), has shortcuts for depth and also does all the stuff that default transform does (including multiple object transforming). It saved me so much time on level editing. Also not using default 2d graphics. There’s not much animation in this game though. If you are working with Unity, i suggest you to make an editor-window like this and put there all the frequently used functions. This one allows me to quickly lock background/foreground, add shapes/sprites/bodies to objects and bunch of other useful stuff. I spent a lot of time choosing color scheme, and then cutting all the platforms, but it was fun. 1) I spent most of the time working on mechanics, graphics and level design instead of code. 2) Engine didn’t break down, all the custom tools worked as planned, so i didn’t waste any time debugging tools. 3) All graphics were made to look crispy in resolutions up to FullHD. 1) Didn’t manage to implement some of the mechanics i wanted, and didn’t make enough levels. 2) The game becomes too hard too soon, again, could be solved with more levels and more gentle difficulty slope. 3) No sounds, no music. I didn’t think about it, but i should have chosen some free music before the jam. Thanks to everybody who participated, having a lot of fun playing your games! Well, this was my first Ludum Dare, my first game here and here’s my first post-mortem. I didn’t start early. I saw the theme and went to bed, then let it boil for half a day after I woke up. Had a few ideas in my head, wrote a couple of them down and in the end I decided on an asteroids-based puzzle game where you only have one shot to destroy all the asteroids. Puzzles are designed with screen wrapping in mind and require you to think differently about your environment. Since I was set to hold an introductory game development class a week after Ludum Dare, I decided to try out Scirra’s Construct. Finished on time – I stared late, some 12 hours after the theme was announced and I also had some obligations that took half of my Sunday. Still, I kept my scope small, managed my time well and successfully submited the game on time for compo. Slept well – Even though I had lack of time dedicated to Ludum Dare, I decided to have my 8-hour sleep and be productive rather than crunch mindlessly. I’d say this helped me keep my mind clear and finish. Got friends into Ludum Dare – When theme voting began, I was pinging my game dev friends to come vote and join LD, even before the jam started. When I got to work, I kept talking about my progress for Ludum Dare and I guess I managed to motivate two of my friends to join in the fun. Knowing that they are also part of LD made this a pretty grand experience. They both managed to finish, more or less, and you can try their games here and here. I almost lost my project – I made audio with as3fxr and one of the audio files didn’t bode well with Construct, so it hung on import. I waited it out for a while, realized it’s not going anywhere and decided to “End Task”. It asks me to save, I save it to a new file just in case, then it asks me to save again, ok, I saved again. Open up the new project file and what do I see? A construct demo project that I used as a reference when starting out. Fortunately, I was considerate enough to save as a new file, otherwise dissaster would have struck. Later I uploaded the project, full of joy that I have done so before the submission hour, and shared the game to my friends. Some time later I’m getting feedback “Hey, mate, this is nice. Would have been great if you had a game over screen, though”. “But I do have a game over screen”, says I to myself. I check the uploaded version and it turns out it’s not the latest one. I assume Dropbox is caching files, try fiddling around, but nothing. Then I get back into Construct to export the project again, only to realize that at one point during the fiasco above it decided to change the export directory to my desktop. There’s still time, so I upload the game and go back to my joyful self. Would have liked more time for audio – I only had about one hour for audio, and Construct started bailing on me then. I wish I could have tried out more sounds and perhaps put in some more fitting audio. As it is, it’s a bit rushed and missing a preloader. My Old Kentucky Home (MOKH) is a Twine based work of interactive fiction written during the compo. It’s my first completed work in Twine, though I’ve attempted work in the medium before, and my second Ludum Dare entry ever. Previously I’ve worked in HTML and in card games. The games soundtrack is also performed by me. This is meant to be read after you’ve played the game, so it does have spoilers/etc in the contents. If you care about things like that, then you shouldn’t continue reading until after you’ve played. The playthrough’s I’ve watched take about ten to fifteen minutes. You can play the game here. MOKH is a story about a fifteen year old girl named Emily who lives in rural Eastern Kentucky. Two years ago a massive calamity took place that she refers to as the Happening. It’s a class-A, post-apocalyptic event — think zombie invasion, Rapture, I am Legend. Whatever has happened has left her alone, living out of a coal mine in the woods above her empty town, and she is running low on supplies. The basic premise of the story is a take on the tale of Little Red Riding Hood. The music went over shockingly well. I wrote almost the entirety of a game inside a defunct soul studio, so I had a feeling I was going to be including some music into it. I researched the type of songs that I wanted to include, as well as remembering what songs were actually performed at the Eastern Kentucky funerals that seem to have been staples of my childhood. All of the songs were recorded in a single take, and they have a shaky quality in them because I’m terrified of performing. Thankfully that lends itself well to the character. I also feel like I managed to capture a cultural memory of Eastern Kentucky. A large portion of my family is from, and continues to reside in, the area around Pikeville. I attended funerals where family slept in the funeral home the last night of visiting, have sang Amazing Grace at several funeral homes, and have seen the function of coal as a life blood to an area. Some of the strongest women I know are from Eastern Kentucky, and it is that spirit that I wrote Emily. When I read the story aloud, I hear the timber of their accent in Emily’s voice. I say a cultural memory because most of the included details are either from childhood visits or stories told by my mother. The 28th Ludum Dare has been the first for me. I really wanted to attend this game jam and now I did and this is the first huge win for me. I built something in 48 hours, specifically a video game about choice, a hostile environment, and lack of resources. Don’t forget to play and rate “Loop Desert”. I loved to use the Crafty.js engine as the main tool to develop the game, I would thank for this @starwed and @kevinsimper two of the most productive Crafty.js contributors. I was happy with the final concept and I conceived it quickly enough. I used pixel art as I’m not an artist and it was the only way for me to get the job done in 48 hours. I didn’t publish anything (posts, timelapse) during development because I can’t manage coding and sharing together. I would have done more work on music and sound effects but I hadn’t enough time. Note: I made this game at H-Farm, one of the official gatherings of the jam, the only one in Italy. I’d like to thank Hackatron for the organization of the event, great job guys. Our experience in previous jams has taught us that with the short time frame you need to streamline workflows and divide up tasks. During the planning phase of Luminess we made it a goal of ours to create a way to make levels so that Evan did not have to hardcode them all. This would allow him to focus on coding the game and allow Jason and me to design the levels. So, how do you get sweet visuals like this and be able to make a bunch of levels? Evan’s code loads an image that Jason or I create and checks every pixel for specific colors. Those colors correspond to specific types of walls. Generic walls that do no damage are in RGB Grey=100,100,100. The red kill walls seen here at the right are RGB Red=100,0,0. Besides walls, the code also scans for certain pixels and places, PlayerSpawn, FinishSpawn, ColorOrbs, and Enemies. Enemies are drawn into the current levels, their spawns will turn on in an upcoming version. To the left is the drawn image of the level above. The little ‘P’ is where the player spawns and the ‘E’ is to spawn the end portal. 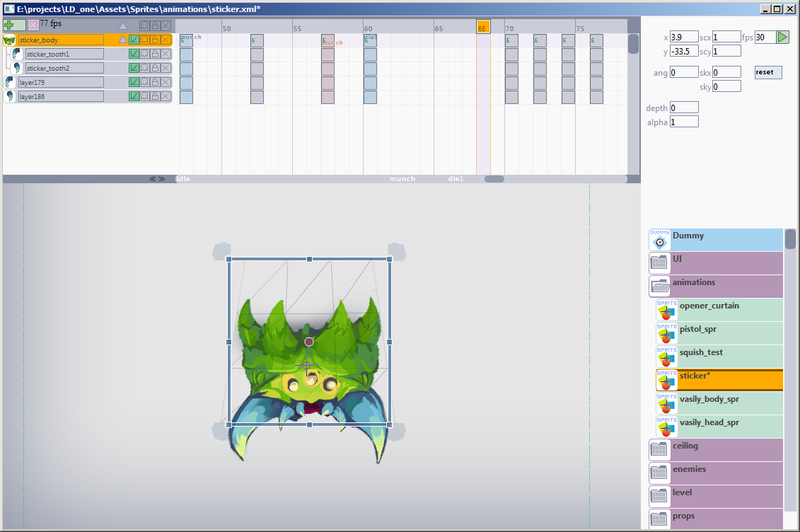 The workflow for level creation is this. We made a template in Pyxel Edit with the precise colors. 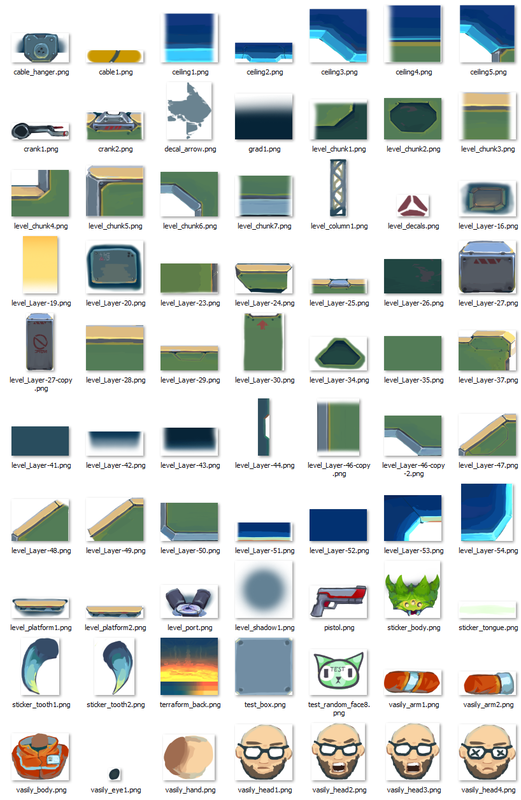 Solid block tiles for various walls and icons for the spawns. The level is designed and output 8x the size. Evans code currently requires each pixel to be 8-bit, so we open the PNG in Gimp and Image>Mode>Indexed>Convert the image. We will be making more levels, and adding enemies. I will make a guide on how you can make levels and maybe we will add them to the game! So check back often to play the newer version! Look forward to reading iiechapman’s post on the Pixel Scanning code with SDL_GetRGB(). Also, darfnagel’s posts on his experience with level design and music production. This past weekend was another Ludum Dare game competition, and the second one I’ve taken part in (this first you can read about here). I also organized a local meetup with the Knox Game Design group and we had five games in total submitted by the deadline. So without further adieu, here is my wrap up of what went right, and what went wrong! For my game, YoGo Burger, I used the theme in a few ways. The setup is, due to some budget cuts, you can only put one topping on a burger. The customer will either be okay with it, or hate it and this will affect the amount of tip you get. To make matters worse, if a single customer complains to management you’ll be fired. To keep this from happening you use your tip money for bribes. In practice the game is like playing multiple games of Mastermind at the same time. Customers will get back in line and order a second burger and if you remember what they liked before you can use that to get it right the second (and third, forth, etc) time. To make it interesting I reset the customer preferences each day, added more customers, and I also upped the value weights behind what they like and don’t. The effect is you’ll probably be deep in debt and fired by the end. The design was very emergent. The initial idea was a Burger Time / Tapper / Diner Dash clone with one ingredient. It’s fair to say I didn’t really have a strong direction at the start, but as I added mechanics it began to take shape. I’m very happy with where I wound up and think that this kind of creative exercise is what the Ludum Dare excels at (even if the game isn’t fun for very long). Just like the last time, I used the competition as an excuse to learn new technology. You might say this is the wrong time to learn something new, but twice now I’ve done it and shipped a game so we’ll have to agree to disagree. The new tech this round was Unity 4.3’s new 2D support. Unity revamped their animation system for the 4.x release, and it’s now called “Mecanim”. It’s a very complex, yet powerful setup allowing you to define animations then link them with a state engine and create smooth transitions procedurally. That’s all good, but I need to move a sprite a few steps to the right and this seemed impossible. I’m sure spending more time with the system is what’s needed, but I have reservations about any system that cannot handle a simple, common use case well. If you cannot do the simple well, how am I to trust you won’t make the complex a nightmare? In the end I wrote a few lines of code to handle all animations. I’m a programmer, it’s what I do. Nothing good to report here. I am no longer satisfied making excuses that “I’m a developer” or hearing “not bad for developer art” or worse “it’s so bad it’s good – you nailed the MS Paint ironic art style!”. See, I’m not trying for that. I don’t expect to be amazing, but I think it’s perfectly fine to expect decent. I commonly tell people I’m not “talented” I’ve just spent a lot of time writing code and anyone can reach where I’m at. I believe this to be true of anything, and it’s time I took my own advice. So next year I’ll be reading up on art 101 and spending quality time with Gimp, Inkscape, and even Blender. Check back with me after 10,000 hours. I needed exactly one sound effect for my game, so why is this even a section? Because it was my favorite part of the whole competition! I wanted a cash register sound when a customer paid for their order, but because of the rules I cannot use anything I didn’t make during the competition and this include sound effects. Normally I’d use the amazing bfxr app to generate game sounds, but it wasn’t really suited for this task. I grabbed a portable microphone and headed out to hunt samples Foley style! In the end I used a bell from my daughter’s bicycle and the opening and slamming shut a wooden drawer full of screws, bolts, and nuts. I then edited and combined those samples in Audacity, speeding up the playback by about 150%. The end result was a very convincing cash register ca-ching! While I’m a horrible graphic artist, I am “decent” at music. This time I wanted to use my own guitar playing (as Dylan and Levi have done), however I’ve never actually hooked up a live instrument to FL Studio with my current audio gear. This led to a frustrating session of attempted guitar recordings before I decided there wasn’t enough time left to keep fooling with it and went with all synths – something I’m pretty comfortable with. (Yesterday I tried again, and it turns out I made a very simple mixer error). The music inspiration came from the depressing, you-can’t-win-gameplay and reminded me of Papers Please. To get in the mood I loaded up some depressing Russian folk songs and waltzes until I had the right state of mind. Not going to win a Grammy, but I think it fit the game well. And finally, as it tradition, here is a time-lapse of me making the whole thing – 17 hours compressed into 3 minutes! 22 queries executed in 0.144 seconds.